Home > Categories > Door control > Open, Sesame! Unless you live in a remote rural area, hardly a day goes by without using an automatic door. From retail outlets to train stations, airports and care facilities, the helping hand is there, but you don’t really think about it unless it malfunctions. Most door operators double as closers and besides adding to personal convenience, they perform vital tasks such as separating different climates zones and adding to personal comfort and security by preventing noise and unauthorized visitors from entering. “They ensure that the door opens up to the right person at the right moment,” says Bertil Skogum, a product manager at Besam, a unit within ASSA ABLOY Entrance Systems. Swing doors are often traditional, hinged doors, retrofitted with door operators to enable easier access or enhanced convenience for visitors. Sliding doors are often found where large amounts of people need to pass through quickly, like on subway cars and in supermarkets. Revolving doors, which preserve the climate in, for example train or bus stations, hotels and shopping malls, are especially suited to regions where the indoor climate is very different from outdoor conditions. Severe climate was, in fact, a major trigger behind the development of the first automatic sliding doors in the 1950s. Two Texans, Lew Hewitt and Dee Horton, saw that existing swing doors had difficulty operating in the high winds of Corpus Christi and decided to design a remedy. In the US, the supermarket explosion of the 1950s and 1960s propelled automatic doors into everyday life across the continent. “The retail sector triggered the development of automatic sliding doors, as these offered a competitive advantage and contributed to convenience for their customers,” says Skogum. Hospitals and health care provided another important arena for the early development of automatic swing doors, since they radically improved the work environment for staff wheeling beds and carrying stretchers and equipment, often in a hurry. They also reduced the need for additional staff to be on hand just to hold open doors. “Today, the biggest applications are still convenience and care,” Skogum says. The health care sector, as well as restaurants, also benefit from the hygienic advantage of having doors that open without contact. A very unusual application is at the Icehotel in Northern Sweden and the new chain of Icebars around the world, where automatic doors are counted on to secure widely differing climate zones and preserve below-zero temperatures inside the bar. At the Icehotel, Besam was given the task of creating a safe and convenient automated entrance that functions reliably while being exposed to temperatures ranging from –5 to –10 degrees Celsius. In addition, the hotel wanted an entrance that not only blends perfectly with the unique environment of the hotel, but also enhances it. While icehotels and icebars are unlikely to become mass-market applications, residential usage is a potentially huge future market that is partly fuelled by changing demographics and an aging population in the developed world. “More people are receiving care at home instead of moving to a nursing home and forcing the elderly to abandon their homes is seen as less desirable both in terms of cost and quality-of-life,” Skogum points out. To meet this shifting need, private homes need to be fitted with various aids that make life easier for less mobile residents, such as interior automatic doors. This is a future market that requires a new type of retrofitted solution at low cost, Skogum says. Also driving demand for relatively inexpensive retrofitted solutions is legislation in the US and the UK, which stipulates that all facilities catering to the public must contain at least one entrance that is adapted for physically challengedcitizens. Besam’s new solution was developed to meet the needs of this market. 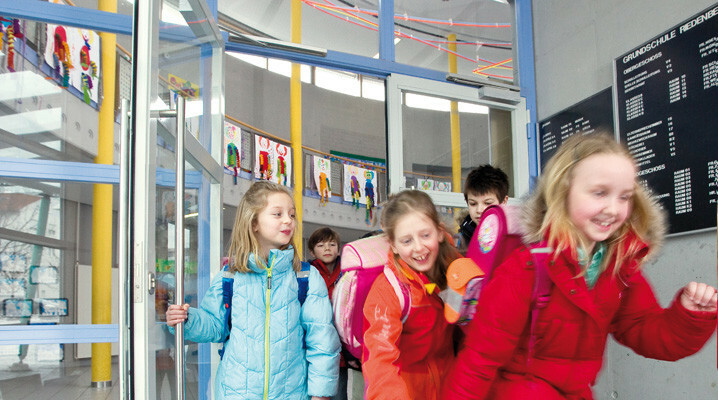 In effect, this has triggered upgrades like ramp building and retrofitting of swing door operators in a host of locations, from libraries and schools to police stations and medical centers. Electronic access control and locks often form part of an integrated system. The “brain” in most automatic doors is a control unit that reacts to stimuli from the outside, for example radar that detects a person who wants to enter, or an elbow switch for visitors confined to wheelchairs. “Information sharing is the key, and this will drive business models and customer value such as customized access control based on face-recognition software and climate-adapted door speed, to name but a few examples. Door operators will become an integrated part of an intelligent system,” concludes Skogum.